There are seven parts of the familiar Christian prayer we call variously "The Lord's Prayer" or the "Our Father". These are numbered below. The first three deal with our future spiritual existence and the second four with our life here on Earth. In each phrase below the key words are in uppercase. 1) Our Father who art in heaven, Hallowed be thy NAME. 3) Thy WILL be done on Earth, as it is in heaven. 5) And FORGIVE us our trespasses as we forgive those who trespass against us. 7) But deliver us from EVIL. These seven parts can be rendered descriptively in the form of a triangle above a square as shown in Figure 1. The triangle contains the three aspects of our future spiritual bodies called in the East, manas, buddhi, and atma or in Steiner's terminology, translated from his German phrases, Spiritual Soul, Life Spirit, and Spirit Body. To understand the relationship between the items surrounding the square and those surrounding the triangle, it will be helpful to know that the NAME phrase refers to the manas or Spiritual Soul which by the end of this 5th post-Atlantean Cultural epoch (PAE), we as humans will each have. The manas can be thought of as the spiritualization of our relatively coarse astral body in current times. This spiritualization is accomplished by our Ego Body or "I" — our immortal Spirit — through the process of faith working on our Astral Body. 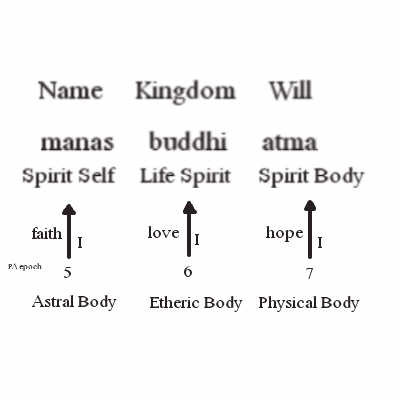 Likewise the KINGDOM refers to the buddhi or Life Spirit which we humans will have fully developed by the end of the 6th PAE through the working of our "I" using the process of love on our Etheric Body. And by the end of the 7th PAE, our "I", through the process of hope, will be finished working on spiritualizing our Physical Body into atma or Spirit Body. To help visualize this verbal description, I have created Figure 2 for your convenience. Now that you know all about it before you start, let's take a deeper look at how Bittleston lays out these parts of the Lord's Prayer for us in his essay. 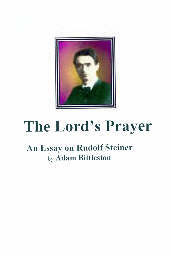 The first petition, "Hallowed be Thy Name", is related by Rudolf Steiner to the purified astral body, the Spirit-Self. We grow aware of the astral body in the first place through the ever-changing life of our wishes and emotions. But in the Nuremberg lectures on Faith, Love and Hope, Rudolf Steiner says that the essential nature of the astral body is to be found in Faith; not a faith regarded as an alternative to knowledge, but one which makes knowledge real and effective. We meet at the present time chiefly a kind of knowledge which remains something external, both to the thing known and to the knower; a piling up of information which gives power without participation. A hallowed or beloved name belongs to a process of knowledge through which the knower can enter and share the life and purpose of the being named. Here thought does not remain a shadowy picture received from outside; it is an active and selfless use of our inner resources, that they may reveal to us the meaning of the world, which would otherwise remain a great unanswered question. . . . In our age, the Archangel Michael battles with the forces which would darken the astral body of man, so that a redeemed human thinking can achieve living conceptions of space and time, in which the Divine is revealed. In this way the soul can come to honour again the Name of a Father Who is both the origin of all things, and Who continually grants and sustains the freedom of His creatures. It is such a Father as this, and not the tyrant figure against which Blake and Shelley and many others have rebelled, that Christianity originally proclaimed — as in the parable of the Prodigal Son. The first petition of the Lord's Prayer looks towards growing knowledge of this Father, and faith in Him; it is indeed an asking, yet one which can be fulfilled only through man's active knowledge and faith. Can we call the first three parts of the Lord's Prayer petitions? A petition is a plea in which we ask humbly for something. The second four parts are obviously petitions or pleas for each of our four earthly bodies: Physical (bread), Etheric (forgiveness), Astral (leading away from temptation), I (deliverance from evil). In the first three parts we humbly: 1) express our faith in Our Father existing in the Spiritual World and sanctify His Name; 2) express that His Kingdom represents our future abode; and 3) acknowledge that His Will permeates all of Heaven and Earth. Let's examine in detail how Bittleston describes the Kingdom phrase. Living knowledge brings man into the realm of the Angels, who bear within them the Spirit-Self, as man will do only in the far future. It is the Archangels, who are the guardians not only of individuals, but of whole communities, who reveal in the present the nature of Life-Spirit. The first beginnings of Life-Spirit are developed by men not as separate individuals, but by their share in what exerts its effect upon communities; Rudolf Steiner gave as examples the effect of great works of art or of true religious rituals. In every enduring human relationship some transformation of the etheric body comes about; and where the relationship lives in freedom, there is a beginning of the "Kingdom." Rudolf Steiner describes in the Nuremberg lectures the basic quality of the etheric body as Love; thus in the absence of Love the forces that sustain human existence wither, as the astral body grows dark without Faith. Insight into these facts would have the most far-reaching effect on human civilisation; and in one sense these petitions of the Lord's Prayer are concerned with the growth of this insight. [page 11] It will be good to think of this both in a way that extends over a great multitude of the living and of the dead, and also to apply it sometimes to a quite specific small group of people, even of two or three. Wherever the individual "I am" is able to transcend itself, in the light of Christ, in friendship and compassion, the Kingdom draws near. In the third petition, the rhythm of the Prayer alters; there are added, to the four words in Greek which echo the structure of the previous petitions, six more, which can be literally rendered in the order of the Greek, "as in heaven, also on earth." The word "earth" prepares for the transition to the sentences that are concerned with the tension of our present existence. Yet the third petition as a whole reaches out to the greatest prophetic vision of all; to the ultimate reconciliation of all being in God, the new Jerusalem. The phrase "the tension of our present existence" directs us to consider where we are in the current 5th post-Atlantean Cultural epoch which extends from 1413 A.D. to 3573 A.D. In the second third of this epoch we are working on our astral body with our "I" through the forces and processes of faith to spiritualize our astral body into manas or Spiritual Self. Even though we are only working on the first level in this 5th PAE in which our closest connection is with our Guardian Angel, we look even now towards ways that we can begin deepening our connections with the Archangel who shepherds our individual cultural community, and with the Archai who, as Time Spirit, lead the entire world's culture in the proper direction. [page 12, 13] Those hierarchical beings who are beyond the Archangels, the Archai, have the innermost kinship with such objective, world-serving will. They work to bring into each succeeding civilisation selfless and universal purposes. In fiery devotion they span the immense abyss, from highest heaven to depths of earth, stirring the passing days that they may remember the beginning and the end. To serve these Spirits of the Ages does mean for individual men a sacrifice; not a fatalistic acceptance of outer conditions, but the putting aside of personal aims to admit impulses of the will that are more than personal. These may stand in the strongest contrast to the existing environment, and yet serve the real needs of the world; we can find examples of service to the realm of the Archai in the combination of vigorous independence with patient devotion by such personalities as John the Baptist or Joan of Arc. The third petition includes both contemplation of this kind of greatness, and the facing of those hindrances with which the following petitions are concerned in particular. The first of the square's petitions for our current Earth existence is food for our physical body. "Give us this day our daily bread." Even as we ask, it is given to us, the New Testament tells us. The fourth petition, which seems so straightforward, is in reality the meeting-place of all the mysteries of the Prayer. It is only in appearance that the nourishment of the physical body is a simple thing. The greatest wisdom was used in the ancient world to develop the plants which could serve human nutrition in a way that the wild plants could not do. And behind every loaf of bread there is a network of rights and relationships of the most complex kind; rights over the use of land, over the use of human labour, and the control in the Karlsruhe lectures, From Jesus to Christ, and again in the Nuremberg lectures, that Christ becomes manifest as Lord of Karma, enabling men to work out their personal destinies in the way that serves best the need of all humanity. How might we understand the process of forgiveness of trespasses on a process level as well? When someone puts a dent in our etheric body by trespassing on either our primordial, primary, or secondary property, and then they subsequently recognize their deed as a trespass and offer an apology and a restitution (if appropriate), the dent they made in our etheric body pops like a dent in an automobile's fender in a body shop, and the pain we felt disappears at the same time. Thus the passage "forgive us our trespasses as we forgive those who trespass against us" made be understood to say, "allow the dents we made in others's etheric bodies to be released at the same as we release the dents that others have made in our etheric body." Rightly understood there is a magic quality to letting go of the dents in our etheric body inflicted by another's trespasses: it undoes the dents we made in others's etheric bodies. If you have trouble understanding what is meant by releasing a dent in your etheric body, consider the way you felt immediately before and after you made a decision to forgive someone for a trespass against either your primordial property (some personal slight or violence), your primary property (some unauthorized appropriation of your thoughts or ideas), or your secondary property (some damage or theft to your auto, home, or belongings). So long as you hold a grievance against the transgressor, you are maintaining a dent in your etheric body. As soon as you release the grievance, not only are your personal dents released, but those dents you have made in others's etheric bodies are released as well. In the passage on forgiveness, Bittleston uses the metaphor of a "knot" instead of a "dent" but the concept is similar. "Untie the knots we have made in others's etheric body as we untie the knots that they have made in our etheric body." When we refuse to forgive, we set the barrier of our minds against this work of Christ; we claim repayment in our way, in our time, instead of accepting the healing of destinies through Him. We hold on to the knots in our etheric bodies, instead of allowing them to be loosened. When we achieve forgiveness, we are making use of the deepest essence of the etheric body, its origin in cosmic Love. And we prepare ourselves to meet the shining stream of Light, the heavenly power of forgiveness, which awakened the soul of Paul on the road to Damascus. In the third of the square petitions, we encounter the remarkable concept that "No temptation is greater than God." After all if there is a friend upon whom we can depend to lead us out of any maze, then there is no maze too difficult for this friend to solve. No matter how lost we seem to be, we have only to call upon that friend and we will be led out of the maze. With a friend that we have faith in, we can never fear to get lost in the most difficult maze. In the moment we ask to be led out of the maze, the maze ceases to have power over us — we are like the former slave-trader who wrote about his experiences in the song, Amazing Grace, "I once was lost, but now am found, twas blind, but now I see." Yes, it is an amazing grace when we discover that no temptation is greater than God. Endless questions and uncertainties surround to-day the sixth petition. How is it possible that God should lead us into temptation? And is not temptation the common lot of everyone, which we should not seek to escape? To begin with, it is necessary to see exactly what "temptation" means. The Greek word is peirasmos, which is related to our words "experiment" and "experience"; it means a testing, a trying out. The same word is used to the disciples at the tragic moment in Gethsemane when they are asked to remain awake: "Pray that you may not enter into temptation." What sort of test is it, before which the disciples may stand at that moment? It is the testing of their faith; and this is the fundamental meaning of peirasmos for the early Christians. In persecution, before the threats of the powers of this world, before destinies which seem too hard to be borne, faith is tested; and the faith, even of a Peter, can fail. Here we are concerned with the basic quality of the astral body. What are more generally described as temptations, the many wishes which beset us, have their power because of the weakness of faith. "Your heavenly Father knows that you have need of all these things "; the astral body that is filled with faith is able to wait and trust. For what then does the sixth petition ask? The same experience, which is for one human being an agonising temptation, may be for another a grief patiently accepted. The events that led up to the Crucifixion deeply troubled the faith of the disciples, but there is no sign that for any moment the Mother of Jesus was shaken in this way. When human beings can see the purpose of an event in the light of eternity, however great their sorrow, their faith need not be affected at all. It would be great presumption to believe oneself able to meet all events in this way; but we can pray for each other, that we may find a light upon our destinies, which enables us to see enough of their meaning that we do not fall into despair. The Greek of the sixth petition strongly emphasises into, the direction in which the path grows continually darker. Pride inevitably leads us in this direction — as Mary says: "He has scattered the proud in the imagination of their hearts." The community of Christians humbly asks to be shown the way which leads into light. Since temptation yielded to leads us into sin, it would seem prima facie that fourth petition of the square would be redundant, simply a re-stating of the third. But seen in the light of what spiritual science reveals to us about the four bodies of the human being in this time, it is clear that Temptation is related to the passions of the Astral Body which we as humans must learn to overcome, and that Evil is related to the decisions which we make in freedom with our Ego Body or "I". The "I" and Evil are inextricably intertwined — like they say about love and marriage, "you can't have one without the other." The "Fall" of Adam and Eve when they ate from the "Tree of Knowledge" was actually a "Leap" into freedom for all of humankind to come. We yet eat from the tree that our first ancestors ate from, and the fruit of that tree is still freedom. Before Adam and Eve, humans existed in complete harmony with the spiritual hierarchies — our will, our decisions were at one with them. With our Leap into Freedom, it became possible for humans to make independent decisions. With that independence came the possibility for things to exist that humans were not ready for and thus the possibility came to be for evil to exist. Evil, according to Steiner, is, rightly understood, a good out of its proper time. Like driving an automobile would be for a toddler or driving a horse and buggy on a modern freeway — the former is a good before its time and the latter a good after its time. Both are examples of activities have the possibility for what would be a good in its proper time to become an evil when done out of its time. If one ponders the matter carefully, every evil can be seen to be a good operating out of its time. With freedom, the possibility exists for human beings to make decisions to bring evil into the world by performing good deeds out of their time. The last petition is related by Rudolf Steiner to the core of man, the "I am." It is by the power of this central element within us that the other members of our being may find their gradual purification; not that man's ego by itself can accomplish this, but from this source the essential decision must come. In the Gospels, the Christ asks again and again of human beings whom He is prepared to heal, for their own consent and participation, their active will to receive healing. Much is given indeed to those who receive it unconsciously, for whom others may speak; but increasingly through all history decisions are given into the hands of individual men. It is possible for man to choose the work of destruction, rather than to act in harmony with those beings to whom he owes his own origin. By making this choice, he gives himself into the service of spirits who have already for long ages worked as enemies of the Divine. Their intention is to make of man something utterly different from that original heavenly purpose, to which the fundamental structure of his physical body bears witness. "The evil" of which the seventh petition speaks is a conscious alliance with the destroyer of manhood, the being of whom Christ says, "he was a murderer from the beginning." It may seem as if evil of this kind was very remote from ordinary humanity. But this is an illusion. Self-knowledge leads everyone to the insight that the darkest evil is latent within him, and could come to expression. The decision to follow the Christ does not in itself make this impossible; at the Last Supper, when He speaks of the betrayer, the disciples have to ask, "Is it I? " Nevertheless, to ask for liberation from the evil is not to seek something which cannot be given on earth. The "I" is endangered by evil because it is incomplete; its emptinesses give the evil an opportunity. When it is truly filled to overflowing from within, the destroyer can find in it no place. In St. John's Gospel, this is shown in the description of the beloved disciple, whose head rests on the breast of Jesus. He can ask about the betrayer, because evil has no longer any hold upon him. Through his "I" there streams the fulness of the spiritual Sun. 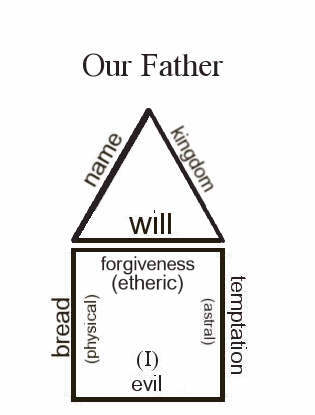 In summary, the Lord's Prayer or Our Father is composed of seven petitions, a set of three followed by a set of four, as in the triangle placed over a square in Figure 1. The first three petitions of the triangle bring to mind our future spiritualized astral, etheric, and physical bodies upon which we will work during all of the remaining time of our Earth planetary embodiments. The four petitions of the square represent our request for help for our four major human body components, physical body, etheric body, astral body, and Ego body or "I". In the closing coda of the Lord's Pray, "For the kingdom, the power, and the glory are Yours, forever and ever," we sing the praises of the spiritual Beings of the 2nd and 1st hierarchies. 1. To summarize the definition by Andrew J. Galambos of property: First he defines property as “a person’s life and all non-procreative derivatives thereof.” Primordial property is a person’s life. Primary property, a person’s thoughts and ideas. Secondary property, everything else, clothes, house, rights to use another’s property, etc. all of which can be seen to derive from primary property which in turn derives from primordial property. Primordial property includes the physical and etheric bodies of a person because without the etheric body, there is only a corpse — no one is home to own the physical body. Primary property stems from the presence of an astral body which is the agent of thoughts and ideas in a person. Secondary property stems from decisions made in freedom by the Ego or “I” of the person. One cannot be said to own secondary property unless one chooses it freely. Someone can force a gift on you, but you can choose to dispose of it as quickly as it would be polite to do so. Thus it can be seen that the Lord’s Prayer in the four petitions of the square provides guidance for humans in our handing of our property: primordial, primary, and secondary property.